As I was riding with Principal Shigehiro Ito on the way to Saigo Elementary School in Toyohashi City, he explained to me that people living near the school strongly supported activities related to the school's doll named Koneta. During my visit to Saigo Elementary, I had the opportunity to meet several of these people and to learn more about the many activities they have organized and promoted. Koneta was found in the school's closet in 1987, and after this time a group of people living near Saigo Elementary School searched to find information about the birthplace of Koneta based on the passport that came with the doll in 1927. 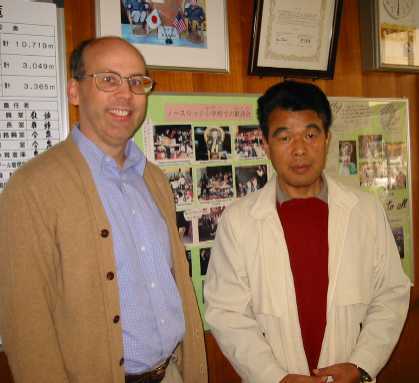 In 1996, Koneta and several representatives from Japan went to Wapakoneta, Ohio, from where Koneta was sent to Japan by the Presbyterian Missionary Society about 70 years before. As a result of this trip, Northridge Elementary School in Wapakoneta and Saigo Elementary School became sister schools. At that time this group was called the "Koneta" Doll Homecoming Committee. In this article, I refer to the group as the Koneta Friendship Doll Group. During the past five years the students at Saigo Elementary have had an active exchange with the students at Northridge Elementary School. The principal's office and the walls of the school halls had many photos, dolls, letters, drawings, and other items related to the friendship between the two schools. In the five years of their sister school relationship, some students had the opportunity to visit the other school. Last year the wife of the governor of the State of Ohio visited Saigo Elementary since she had heard of the activities between Saigo and Northridge. Saigo's principal mentioned that they would like to do more activities between the two schools, but sometimes the difference in languages was a challenge. Last year the Koneta Friendship Doll Group, in cooperation with Toyohashi City, decided to hire an expert doll maker to make two replicas of the original Koneta. One of these replicas was sent to the children of Northridge Elementary School as a sign of the two schools' strong friendship. The other replica is displayed at the front entrance of Saigo Elementary School, where the children can see the doll each day and touch it without concern about damaging it. The original doll from 1927 is kept safely in a display case inside the principal's office. After lunch I had a chance to talk for some time with Mr. Katsuhiro Natsume, who has had an intense interest in the Friendship Dolls since 1987, the year when an article was published in a local newspaper about the finding of Koneta at Saigo Elementary School. At that time Mr. Natsume was teaching English to ninth graders, and he was searching for a theme for a final lesson that would have great impact on his students and would be something they would not forget later in life. After reading the article about Koneta, he decided that the Friendship Dolls would be the theme of the last lesson for his students. He busied himself in research on the Friendship Dolls to prepare for this final lesson, when he taught to his students the importance of peace and the value of a life in which one does not lose oneself even during crazy times, such as during World War II. Since that class when he first taught the valuable lesson of the Friendship Dolls, Mr. Natsume has searched actively to find American Blue-eyed Dolls and Japanese Friendship Dolls. 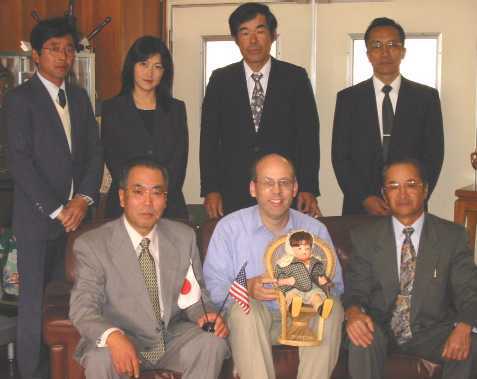 He has been involved in finding four Japanese Friendship Dolls in the United States. He is now retired from teaching, and he hopes to complete soon a book he has been writing based on his extensive research on the Friendship Dolls. Mr. Natsume presented to me one of Eiko Takeda's books on the Friendship Dolls, and we agreed to keep in touch with each other. 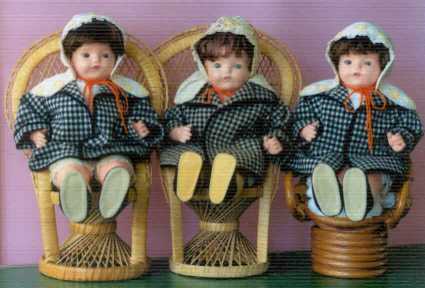 The Koneta Friendship Doll Group provided me with much interesting information about Koneta, which I hope to be able to add soon to the Friendship Dolls web site. The group also presented to me a beautifully decorated hagoita (wooden paddle traditionally used in New Year's game similar to badminton) and a sack of locally-grown persimmons.